The best place to start is a good breakfast. I prefer my oats savory. This was inspired by a close friend who shares my aversion to sweets first thing in the morning. This is how I do it... I adore the Quick Cook Steel Cut Oats at Trader Joes they are done in just 8 minutes. But if you don't have a TJ's close by you can always make a big batch and heat it up throughout the week. 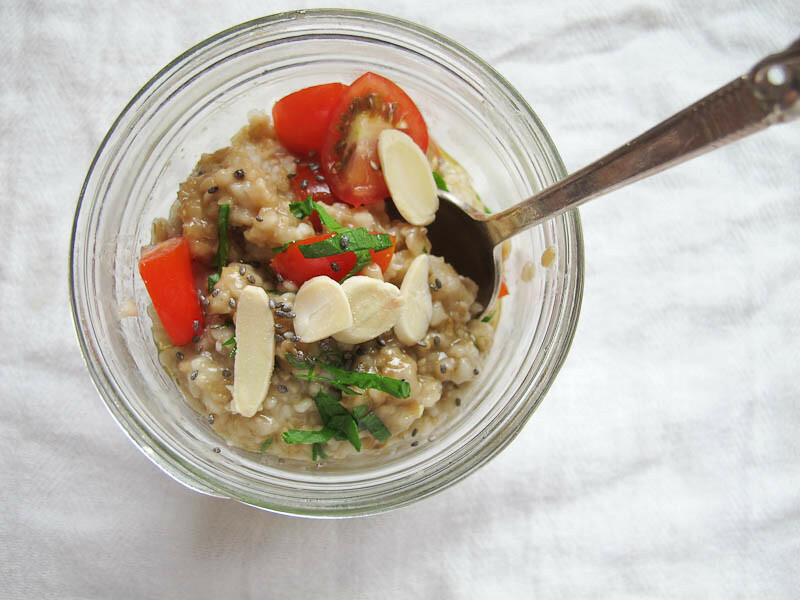 Once the oats are cooked I add chopped cherry tomatoes, fresh parsley, chia seeds, roasted almond slivers, olive oil and Bragg's. Mix & enjoy. And just like that...she's back. i'm going to try this with some roasted yams instead of tomatoes...only because i have no tomatoes on-hand. hadn't thought of using roasted veggies... I think roasted zucchini could be yummy too... you must try the tomatoes sometime... all the yummy juice and seeds warms up and adds a lot to the oats.